The C128 Kevin Wilkins Leaf Storm will very likely be introduced in 2009. The C128 is named "Leaf Storm" in the 2009 Spyderco catalog, but is packaged in a box labeled "Leafstorm". Kevin Wilkins' original design is also named "Leafstorm". Spyderco/Wilkins collaboration thread on the Spyderco forum. 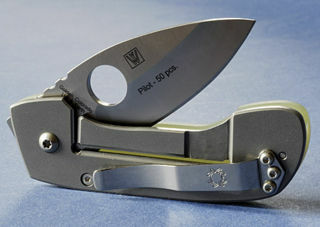 The "Leaf Storm" spelling is used in the 2009 Spyderco catalog. A custom knife by Kevin Wilkins is called "Leafstorm". "On our USA production here at the Spyderco Factory, there are many steps involved in the knife manufacturing process from the initial concept to full production. A Pilot Run is the final step before full production, a small run of knives (typically 50) are manufactured to prove all of the manufacturing processes from start to finish and allow our teams to make any necessary tweaks and changes before a large run is produced. Beginning with the Leafstorm in 2009, we began differentiating the Pilot Run with engraving on the blade in order to help identify them as we occasionally make changes and do additional research and development with the knife and/or manufacturing processes after the initial Pilot Run. Sometimes we may even have more than one Pilot Run on a product if something doesn't flow properly. Typically, there are 50 or less and because there are so few, we will not be offering them through our collector program and there will be no waiting lists, holds, call aheads, etc. All pilot runs will be announced on the Spyderco Forums, Facebook, MySpace and Twitter and sold at full MSRP through the spyderco.com website on a first come, first served basis until they are gone. Please keep in mind, this is only on products produced in our USA factory in Golden, Colorado. The current pilot run for sale is the C128GP Leafstorm.­"
"Why graphic artists make the leap to knife making is self explanatory. Their work in designing and creating art comingles with their knife passion, in some cases their knife obsession, blurring the lines between livelihood and hobby. American Kevin Wilkins started as a graphic designer and art student then an art director. He moved to Berlin in the early 90s where the knife bug really sank in. By 1995 he worked out how to make his hobby a livelihood and one of his favorite designs he called the Leaf Storm." "Spyderco's production version, like his original custom piece, fits and carries in the watch-pocket of a pair of denim jeans. It features a Chris Reeve style integral Lock with the back titanium handle scale doubling as the lock's liner. 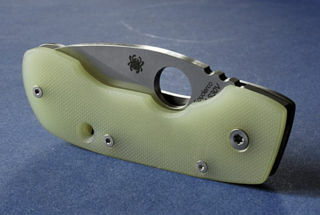 Screw together construction attaches the titanium back to a natural colored G-10 front scale. A hollow-ground CPM S30V blade has a ricasso, spine jimping and is available in a PlainEdge." The C128GP Leaf Storm in the Spyderco's online catalog. One of the 50 engraved ones will probably be worth more in the long run. This page was last modified on 7 January 2013, at 03:22.